NOTIFICATION: CBSE is stand for “Central Board of Secondary Education”. This educational Board conducts CTET Examination every year to recruit the teachers all over India. CBSE is going to conduct the 11th edition of Central Teacher Eligibility Test (CTET) on 16th September 2018 (Sunday). The CTET test will be conducted in 92 cities all over the country. The detailed Information related to various factors such as: syllabus of CTET Exam, various eligibility criteria, application fee, cities where examination take place and important dates relates to this CTET Exam 2018 will be available on CTET official website only. The official website link is: “www.ctet.nic.in”. This all detail will be available on the website on the following dates: 12th June 2018(Tuesday). 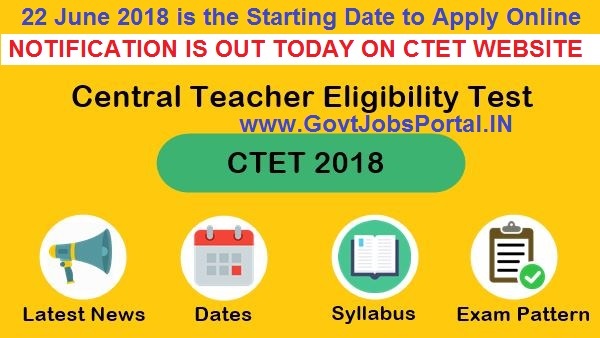 We will also share the complete detail related to CTET Examination 2018 here also on https://www.govtjobsportal.in . The interested applicants who are wishing to apply for this CTET Exam 2018 are requested to download the Information notice from above mentioned website only and read the same carefully before applying for this CTET Exam 2018. All eligible Indian candidates have to apply online only through CTET official website www.ctet.nic.in. The online application process will start from 22nd June 2018 (Friday) onwards. The last date for submitting online application is 19th July 2018 (Thursday) and fee can be paid up to 21st July 2018 (Saturday) before 3.30.p.m. Sd/- Director (CTET). What is the Examination fee for Applying this CTET Exam 2018? What is the Process for Applying this CTET EXAM 2018? Candidates who meet with the all eligibility criteria and wishing to appear in this CTET Examination can apply online. The link for applying online will be activated on 22nd June on the official website of CTET Department. We will also share the direct link for applying online on the given date. 22ND June 2018 is the STARTING Date to apply online. 19th July 2018 is the Last Date to apply online.